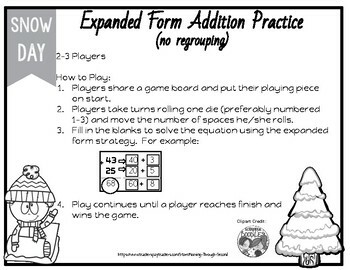 Practice Expanded Form Addition (sometimes called the "Splitting Strategy") using this board game. Note: There is no regrouping in this game. Additionally, students write directly on the game board to complete this game, so it also acts as a recording sheet. Please download the preview to see how students fill in each game square! As well as to see the exact size of the game board. Players share a game board and put their playing piece on start. Players take turns rolling one die (preferably numbered 1-3) and move the number of spaces he/she rolls. Fill in the blanks to solve the equation using the expanded form strategy. Play continues until a player reaches finish and wins the game.